Habitat Update: Thank you to everyone who took part in making the St. Vital Habitat Interfaith Build a success! The cash donations received to date from St. Vital churches and the Rotary Club for the 2018 St. Vital Habitat project total just under $42.000. In addition, there have been other major donations, the Ursuline Sisters of Tildonk ($100,000), Wall Grain Handling ($15,000) and others. Also several gifts-in-kind have been contributed – wiring and electrical from Jorey Electric; roofing, fascia and eavestroughs by All City Exteriors; drywall taping and mudding by Alex Simard and paint from Homepro Painting and Decorating. Thanks to everyone for your generosity! Habitat Family: Anita Mbaye and children, her 15 year old son and daughters aged 12 and 10. They are originally from Senegal, Africa, are fluent in both English and French, and have recently become Canadian citizens. Anta is employed as a Health Care Aide and is working to become a registered nurse. The children attend French schools in St. Boniface. 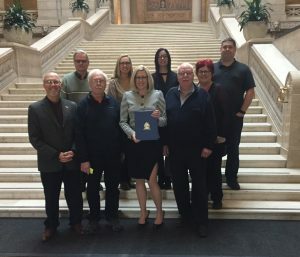 On, Monday, March 12th, Rochelle Squires read a private member’s statement at the Manitoba Legislature. Rochelle is very pleased to honour and recognize the contributions of the St. Vital Interfaith Project. The Friday March 23 Interfaith Festival Evening, was especially highlighted by our friend Ali Karim (of UCiM) and his students of the Hi Life Steel Drum Orchestra. This group got a standing ovation, by the other performers and the 240 guests!! We had 40 people from the United Church in Meadowood in the audience!! Wonderful! 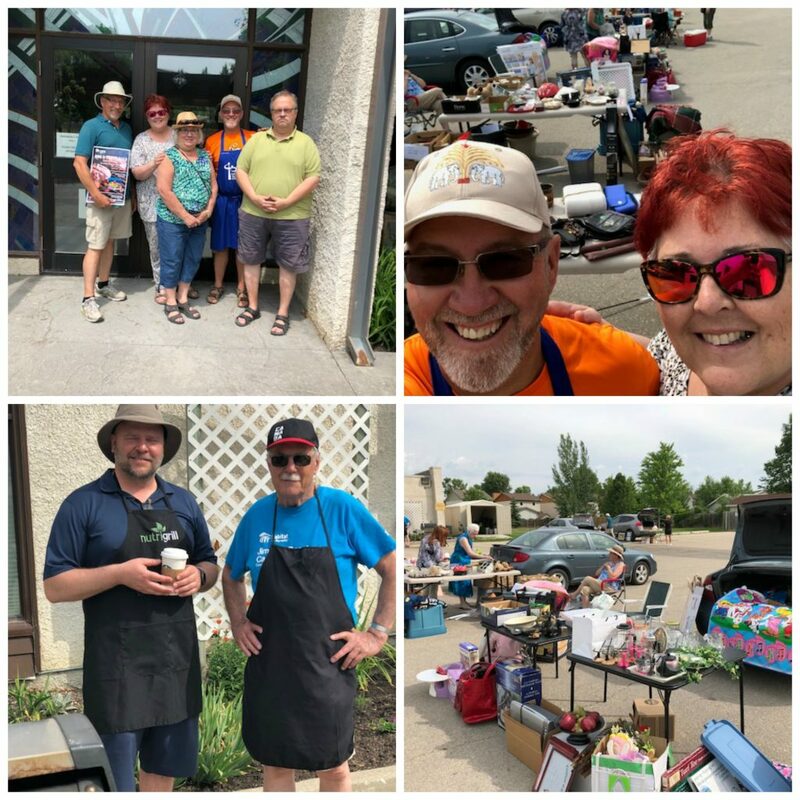 We raised $2400.00, plus another $1200.00 from public donations that night, for a total of $3600.00 for Habitat for Humanity and specifically the St. Vital Interfaith Build this summer. A delicious Spaghetti Supper featuring spaghetti and meat balls, garlic toast, Caesar salad and ice cream with wafers was hosted by St. Emile’s Parish on April 20. Approximately 270 guests were served. Everyone in attendance enjoyed the food, the conversation and friendship with their St. Vital neighbours. Our new Habitat family, Anta Mbaye and her three children were introduced to the diners. Net proceeds from the spaghetti supper and painting raffle at St. Emile’s Parish on April 20 totalled $2315. Thanks to all the participants and guests. On May 12 Faith Lutheran Church hosted a pancake breakfast, a Habitat shed build and a document shredding service. Donations of food and drink for the breakfast were supplied by Macdonald’s, Sobeys, Red Top Restaurant and various Faith Lutheran church members. All money collected was assigned to the Interfaith Habitat project. Shredding services were provided by Phoenix Recycling. B. Mayes, city councillor, sponsored the sign rental. A total of $2500 was collected for the breakfast and shredding services, and an additional $1000 was contributed by RBC. Leftover food supplies were donated to the Winnipeg Centre Vineyard for a Mother’s day brunch for the poor and homeless. 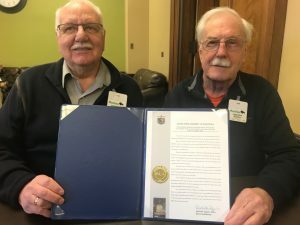 Volunteers from participating congregations in St. Vital and the Rotary Club of St. Boniface/St. Vital built 8 garden sheds on the parking lot for new Habitat homeowners and for sale to the public. Approximately 55 workers participated in the construction of the sheds. Thanks to everyone who helped out.